This Monday was open evening at Miss E’s school, a chance for Paul and I to see inside her classroom and be amazed at the progress our beautiful 5 year old has made in a term and a half at school. Book club was also meeting to review Brother of the More Famous Jack by Barbara Trapido. For a Monday evening this was an unusually busy one! Stylish, suburban Katherine is eighteen when she is propelled into the centre of Professor Jacob Goldman’s rambling home and his large eccentric family. As his enchanting yet sharp-tongued wife Jane gives birth to her sixth child, Katherine meets the volatile, stroppy Jonathan and his older, more beautiful brother Roger, who wins her heart. First love quickly leads to heartbreak and sends her fleeing to Rome but, ten years on, she returns to find the Goldmans again. A little wiser and a lot more grown-up, Katherine faces her future. Published in 1982, Trapido’s debut novel was shortlisted for the Whitbread Novel Award. I knew nothing about the author or the novel before book club. However, it seems Brother of the More Famous Jack is receiving somewhat of a resurgence championed by Elizabeth Gilbert (of Eat, Pray, Love fame). “Since finally discovering Trapido in 2012, I have become a literary evangelist on her behalf. On account of my badgering, all my friends now love her, too. I won’t rest until everyone in America has read (and fallen in love with) this fabulous author.” – Elizabeth Gilbert. I really enjoyed this novel, it was very English in the way the characters bantered with one another … while they sometimes said unkind things and could be quite manipulative, they had a real love for one another. Trapido’s love for her characters really comes across. While they are flawed and far from perfect, they are likeable. As a reader I cared about her characters and what happened to them. While Brother of the More Famous Jack is a novel about destiny, it is also about falling in love with a family, much like “Brideshead Revisited”. Katherine, an only child, sees herself as “heady” and rebellious, until she meets the family of her philosophy professor. She is drawn to the vibrant and bohemian Goldmans, altering the course of her life. In turn, the Goldmans are drawn to the sophisticated and intelligent Katherine, cultivating a lifelong friendship. I keep asking myself if this is a feminist novel … it feels like it is without being overt. Indeed, it seems other women are pressing it into each other’s hands as a “must read”. The men in Brother of the More Famous Jack are larger than life, strong and at times intimidating. Yet I never saw the women as victims. They show strength and excert themselves in their own way. I particulary love Jane’s feisty speach at the end of the novel, and ultimately this is Katherine’s story. This is very much a character driven book. I found myself wondering about a third of the way through when “things where going to start happening?” (perhaps I have been reading too many plot-driven novels, where the action happens at break-neck speed). However this didn’t last long. Trapido has an easy style of writing that is very accessible and I quickly found myself unable to put it down. I couldn’t help wonder if Brother of the More Famous Jack appears deceptively simple. That there is a depth to this book which reveals itself more and more upon re-reading. We weren’t the only ones to review Brother of a More Famous Jack. The ABC’s “The Book Club” also reviewed Trapido’s novel, with Elizabeth Gilbert as a guest reviewer. You can check out their thoughts here. A recommended read … clever, funny, and thought provoking. 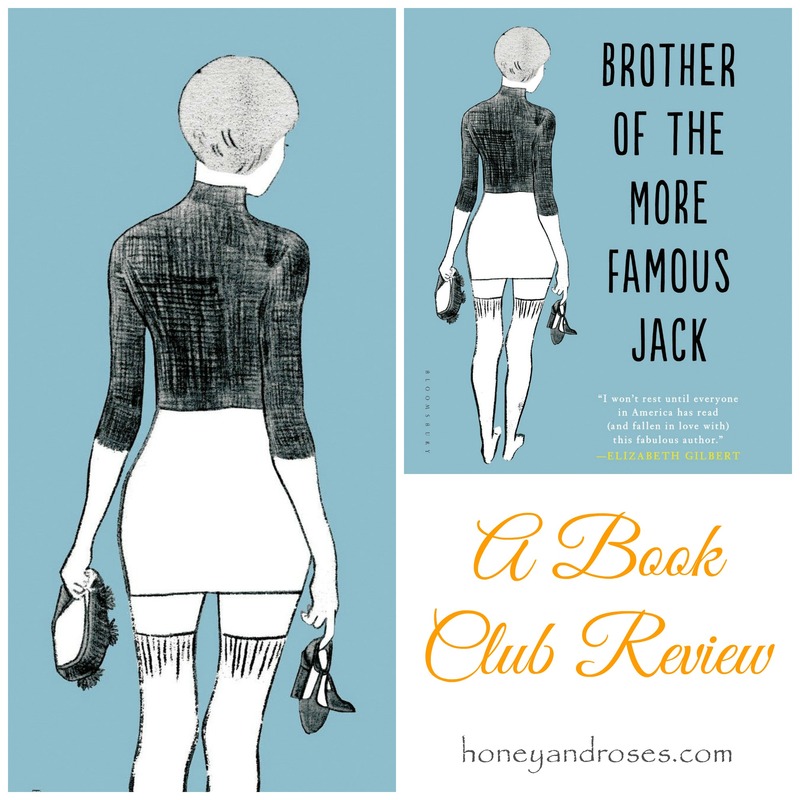 Have you read Brother of a More Famous Jack by Barbara Trapido? What did you think of her novel? Someone in cyberspace needs to develop some book club discussion questions about this lovely book! I’m going to check it out! Thanks for the review. I will check it out. I need some summer reading.